Moving commodity requires efficient equipment. Whether fracking sand, compost materials, grain, fertilizer, seeds or Christmas trees, DPI has developed a suite of economical conveyors to transport your commodities. Our conveyors are efficient and cost-effective. 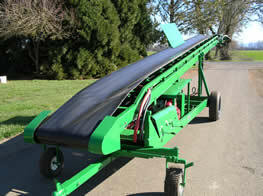 Our sturdy built conveyors will move commodities to trucks for transport to market. They DPI conveyor will give you the economy and the long hours of trouble-free operation you demand. DPI conveyors provide reliability and high productivity to keep your harvest smooth and on schedule. 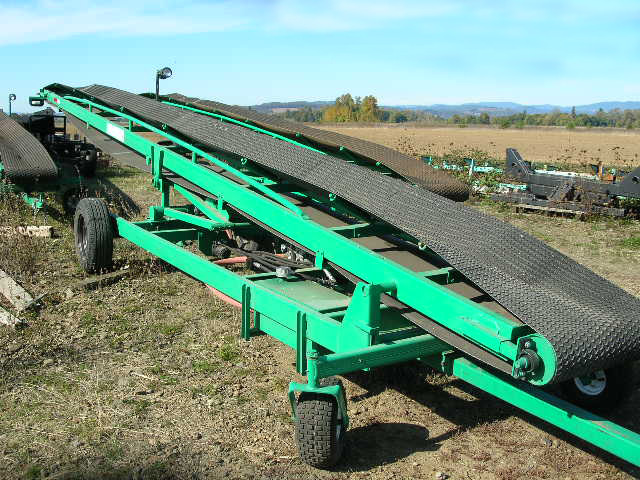 This versatile, high capacity, mobile conveyor features a diesel engine, hydraulic lift mechanism and self-propelled ground drive. with dependable HONDA™ gas engines. They feature heavy-duty construction beginning with a 6" channel frame and use quality components built for years of trouble-free service. DPI’s solution to material handling is a versatile, easily maneuverable self propelled conveyor for use in the field, at the loading dock, or in warehouse. Upper unit features belt running on graduated v-shaped rollers. 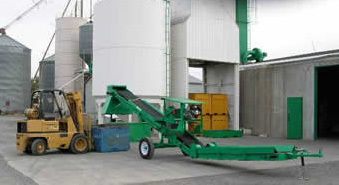 This conveyor has a beater bar at the discharge end to break up compost material as it is loaded into a waiting truck. Power plant - HONDA™ gas or electric engine. Belt rides on graduated v-shaped rollers to keep load in place. Unit length - 32 ft.
Options available include work lights. owner options include electric, gas or diesel. Need a size you don't see here? Call DPI! We can provide a custom build conveyor in the size and dimensions to fit your needs. From flat belt conveyors to box filler conveyors. Our designers can create a conveyor to fit your needs.